The transaction between DeSilva + Phillips client Promotion Execution Partners, LLC [“pep”, www.peppromotions.com] and WPP has been finalized as of January 3, 2017. 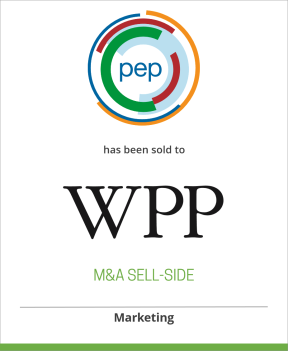 Pep, a Cincinnati-based marketing management and procurement company that oversees marketing promotions for clients, previously announced that it had agreed to be acquired by WPP, the world’s largest communications services company, subject to regulatory approval. With approvals granted, the transaction has closed. DeSilva + Phillips represented Promotion Execution Partners as sole financial advisor in this transaction. Pep, founded in 2004, has to-date managed over $3.5 Billion in marketing spend across 35,000 campaigns for over 500 brands worldwide. Clients include Procter & Gamble, Kraft Heinz, Johnson & Johnson, General Mills, and Mars. pep, oversees budgets, timelines, and vendor coordination for Commercial Print, Digital, In-Store, and Direct to Consumer programs, which are seamlessly executed utilizing pep’s industry-leading marketing management and procurement platform called pepconnect®. The company employs 240 people in 20 offices servicing 14 countries across North and South America.